Spring. Let the count down begin. Only two weeks away. Staring out into the early morning landscapes of snow, frost, and ice over the past month has made it seem like winter will never end. However, winter comes every year and every year this is exactly what I say. I know I’ve reached my limit when my eyes crave color and I find myself fantasizing about flowers. Colorful and fragrant. My Instagram feed is full of west coast floral bouquets that are currently feeding my starving soul. Thank you San Francisco and Seattle for giving me hope that all will melt away and life will be born again. Flowers are so much on my mind, that it has crossed over into an appetite craving. 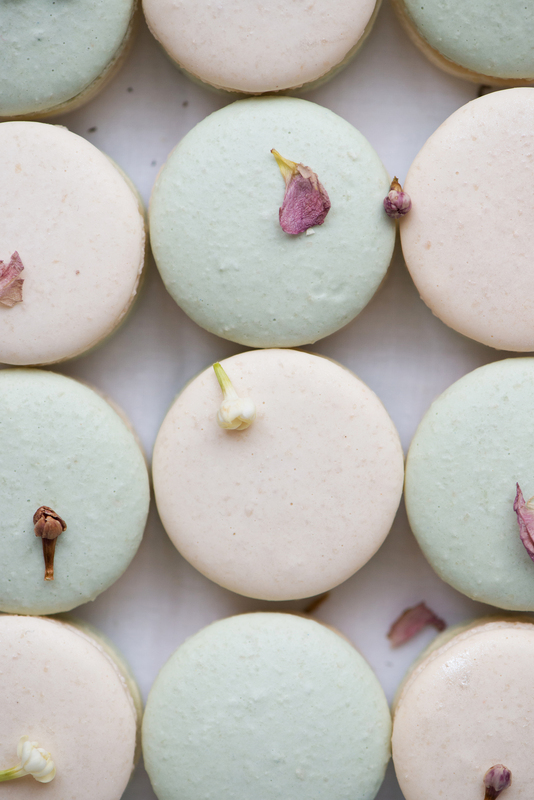 Always a lover of lavender or rose in my pastries, I find myself wanting something more. Something truly dedicated to spring. Soft and delicate, not over-powering, but bright and light. Memories of evening spring-time walks, with the sweet perfume scent of jasmine in the air. Jasmine is the epitome of spring time. With their blooms developing in late winter, early spring it is a sign that spring is here and warmer days are ahead. Thankfully, jasmine is also beautiful in pastries and chocolate. Subtly is the key and with its fragrant floral aroma, it’s a feast for the senses. 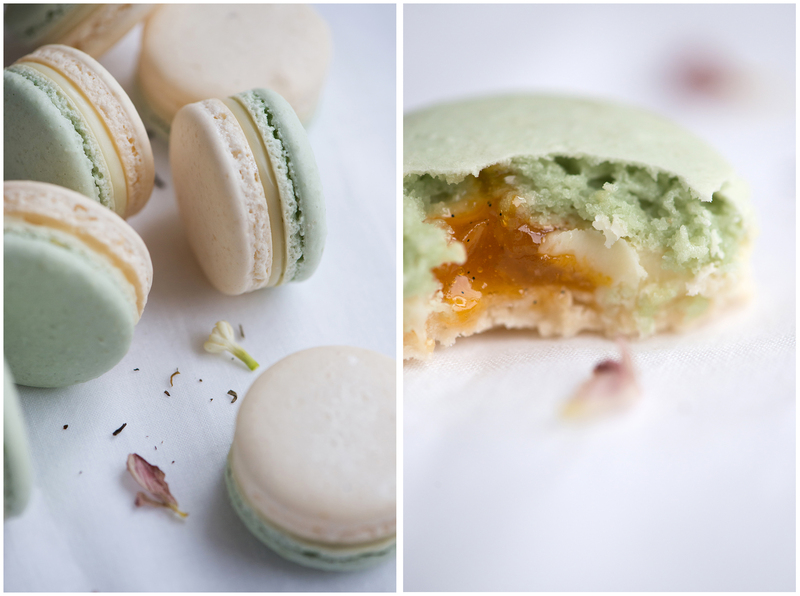 I thought Jasmine Apricot macarons would be the perfect way to welcome springtime. They are creamy from the white chocolate and a little tart from the apricot center. 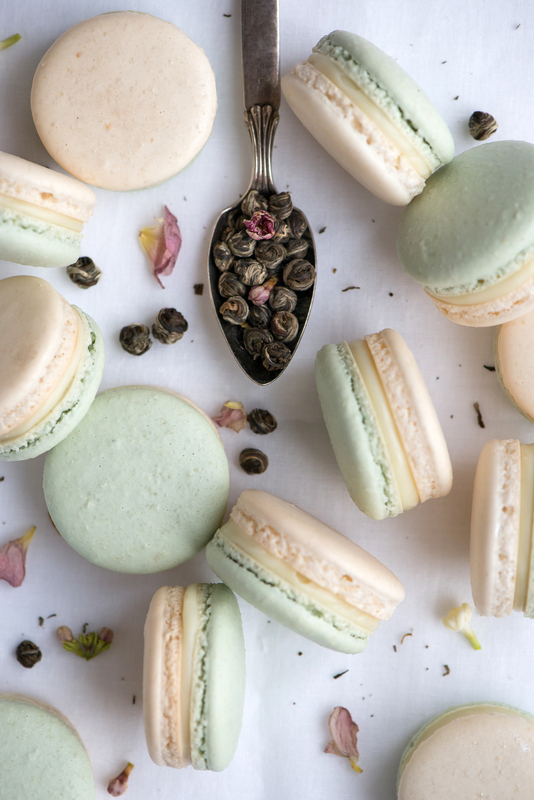 Vanilla bean is a classic pairing to apricots and the scent of jasmine and vanilla together are enough to make you eat every one of these macarons in sight. Welcome spring! *If using store-bought or homemade apricot preserves, add 1/2 vanilla bean, seeds scraped, and mix until combined. Melt your white chocolate in small stainless-steel bowl set over a small pot of simmering water (double boiler). Remove from heat when it is just melted. Wipe any water off the bottom or your bowl carefully and do not to allow any water to touch the chocolate or it will seize up. In a small saucepan, add the cream and bring to a simmer. Remove from heat and add tea pearls. Cover and steep for 5 minutes. No longer or it will become bitter. Strain the steeped cream into a clean bowl and rescale cream back to its original amount. 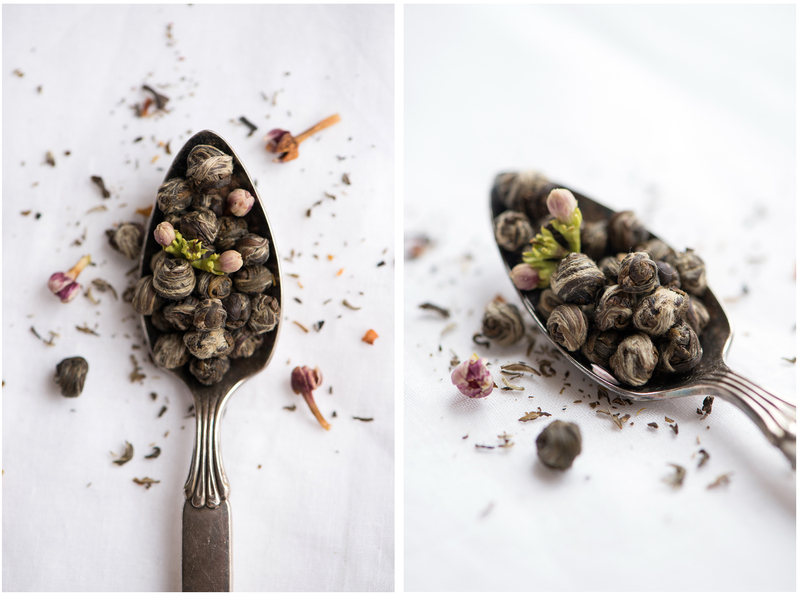 Discard tea pearls. Pour steeped cream over the melted chocolate and using an immersion blender, combine the two. You may also use a spatula to combine the mixture, starting with small circles in the center and working your way out to the sides of the bowl to create a smooth emulsion. The ganache will thicken, become shiny, and develop a puddinglike consistency. Add the butter and incorporate with the immersion blender or stir in thoroughly. Allow the ganache to cool and crystallize until the consistency is able to hold its shape, up to two hours or overnight. Place ganache and apricot confiture into separate piping bags, with the tips snipped off. Pipe a ring of ganache around the edge of the macaron shell and then pipe the confiture into the small gap in the center. Place on the paired-up “top” to the macaron, press gently until the filling reaches the edge of the macaron. Continue until all pairs are filled. Yara, get on it lady! Do you have an example of what the finished macaron batter looks like? Bob’s Red Mill is what I usually have on hand, but any finely ground almond flour will work. If you have any coarse bits of almonds in your flour they can be placed in a food processor and ground until fine. This will help you achieve that smooth surface. Silpats are my go-to, but parchment works well too. Both will give you the same results. The macaronage will determine your overall appearance (feet, height, etc). Unfortunately, I do not have any photos of the macaron batter. It’s more of a “feel” that you learn through making it. Hope this was helpful and good luck! 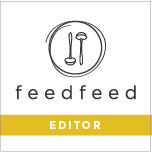 When you mix the almond,sugar + egg whites, do you whisk the egg whites before? Or do you add them just like that? Thanks! Looking forward to making these! Hi Ivette, thank you! No need to whisk the egg whites before adding them to the almond and sugar. Just add them as is. Enjoy making these!